Paris authorities removed hundreds of thousands of metal padlocks from iconic Pont des Arts bridge in front of the Louvre on Monday, with the new anti-romantic token ban possibly breaking millions of hearts around the world - for security reasons. Both Parisians and tourists had been attaching their tokens to the famous 19th century bridge for years. The padlocks symbolically immortalize their love. The tradition has become so popular, it has put the structure at risk, with over 700,000 attached love locks weighing the equivalent of 20 elephants. 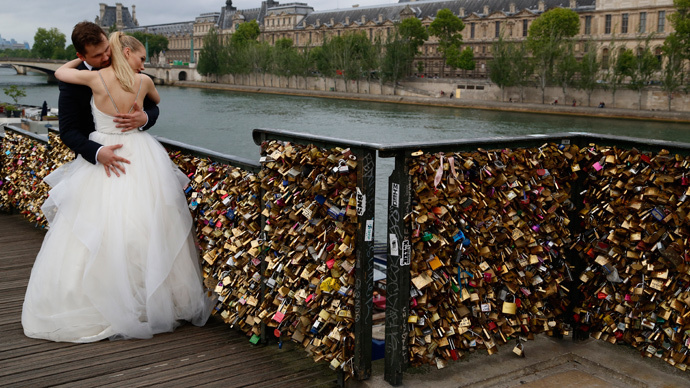 While lovers kept flocking to the pedestrian bridge willing to attach their initialed testaments of love to its metallic grid railings, then throwing the keys into the Seine River, others were alarmed over safety. Advocacy group 'No Love Locks' has been formed launching a long campaign, which eventually achieved its goal of preserving Paris' World UNESCO Heritage sites from the grip of love sick visitors. Workmen started to pull off the metal padlocks on Monday, with the removal expected to continue throughout the week. Access to the bridge will be "prohibited at all times" until June 8, authorities said, asking people to use nearby bridges to cross the river. "It's the end of the padlocks," Reuters cited deputy Paris mayor Bruno Julliard as saying, with the official adding: "They spoil the aesthetics of the bridge, are structurally bad for it and can cause accidents." At least one section of the railing had already collapsed under their weight, and caused potential risk to shipping on the River Seine, the official added. To prevent the practice from re-emerging, Paris authorities will later install protective plexiglass panels. Although love locks have already started to turn up at other locations around Paris, including the Eiffel Tower, they will not be tolerated either, deputy mayor said. "We all want Paris to remain the city of love, of romance. But we think it can stay the city of love without love locks," Julliard added. The authorities are now looking into several humanitarian projects to recycle the metal used for the padlocks that have fallen under the ban, "so that the symbol of love... invested in them will not be lost entirely."